Suzen Millodot is the author of this gorgeous book. 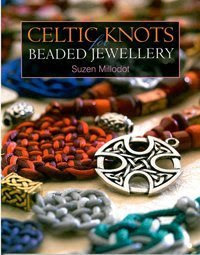 She has created jewelry from real three-dimensional Celtic knots, embellished with beads and pendants. Suzen demonstrates techniques such as button and braid knots, plaits and Turk’s Head knots and shows how to use them to make eighteen different projects, including necklaces, bracelets, rings, brooches and earrings. Thanks for book reviews! Some very interesting subjects!! !